Productivity: Back from the Dead or Dead Cat Bounce? After stalling during the middle of the decade, productivity growth has rebounded back above 1% amid stronger capital investment. Yet even with the recent pickup, productivity growth is little different than its average over the past decade and notably weaker than the late-1990s and early- 2000s (Figure 1). 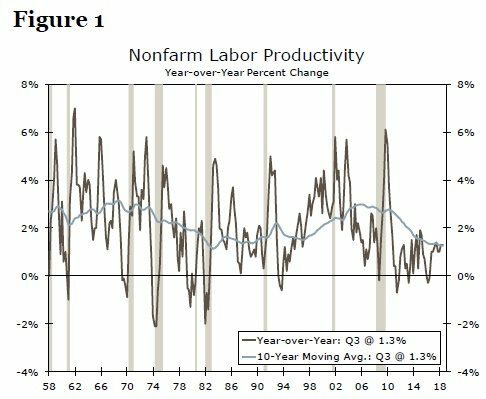 Could late-cycle dynamics, including the tight state of the labor market, spur faster productivity growth, however? Productivity growth will likely remain around 1% this year as both capital investment and aggregate hours worked—the labor input into production—decelerate. The amount of new technology and efficiency filtering into production, known as total factor productivity (TFP), however, remains a wild card for the productivity outlook. TFP is usually thought to be independent of the business cycle. Yet, if the tight labor market supports efforts to develop better technology, productivity growth could end up on a stronger path not just through the remainder of the current business cycle, but on into the next cycle. 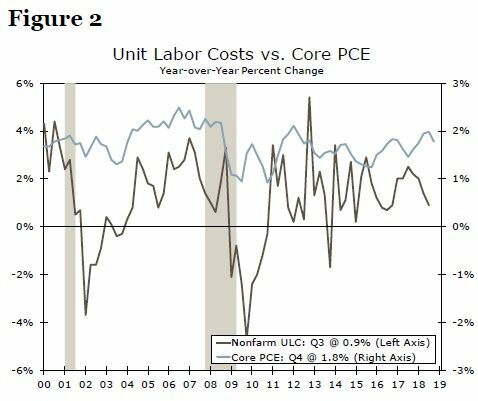 The modest rebound in productivity growth since 2016 has kept inflationary pressures muted even as labor costs have risen more rapidly (Figure 2). At the same time, stronger productivity growth has mitigated pressure on corporate profits. Without further improvement in productivity growth, however, downward pressures on corporate profits and upward pressures on inflation are expected to mount if wages continue to accelerate.